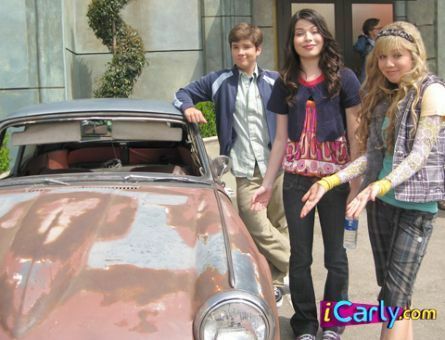 Carly,Sam,and Freddie,and an old junky car. . Wallpaper and background images in the iCarly club. This iCarly photo contains ऑटोमोबाइल, कार, ऑटो, एसयूवी, ट्रक, पालकी, सैलून, सेडान, मिनी कार, and minicar. There might also be कॉम्पैक्ट, कॉम्पैक्ट कार, कॉम्पैक्ट कॉम्पैक्ट कार, हैचबैक, and कूप.